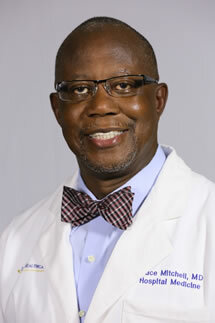 Bruce L. Mitchell, director of Hospital Medicine Services at Emory University Hospital Midtown. Bruce L. Mitchell, a Georgia native who trained at Emory in internal medicine, has returned to his roots and has been named director of Hospital Medicine Services at Emory University Hospital Midtown. Hospital medicine is the practice of caring for patients who are hospitalized. Physicians who care for these patients are called hospitalists. They are board-certified internal medicine physicians who are experienced in diagnosing and managing acute medical illnesses that hospitalized patients commonly suffer. They also provide medical consultation for surgical patients. Born in Savannah, Georgia, Mitchell received his medical degree from Morehouse School of Medicine, then completed a residency in internal medicine at Emory University School of Medicine. He practiced internal medicine in several private practices in South Georgia before joining the Mayo Clinic in Jacksonville, Florida. There he served as a hospitalist for 14 years. In 2010, he returned to Emory. "Joining the Division of Hospital Medicine at Emory was like coming back home for me," says Mitchell, who is also an assistant professor in the Department of Medicine. "I am fortunate to have had the opportunity to return, first as a faculty member at Emory University Hospital, and now as director of Hospital Medicine Services at Emory University Hospital Midtown. I look forward to working in the place where I learned so much during my residency." "We are very lucky to have Dr. Mitchell direct our hospital medicine service at Emory University Hospital Midtown," says Alan Wang, MD, assistant professor in the Department of Medicine at Emory and director of the Division of Hospital Medicine. "He is a tremendous leader with great ties to the community, as well as to Emory. His skill and knowledge will continue moving the division forward." Emory Hospital Medicine is the largest academic hospital medicine program in the nation. With more than 100 physicians providing hospital medicine services at eight hospitals in the Atlanta area, Emory hospitalists account for over 35,000 admissions a year, and total patient encounters exceed 150,000 annually. The hospital medicine program started at Emory in 1999 with just five faculty members. Some 13 years later, the program attracts internal medicine residents from around the country who are interested in specializing in hospital medicine. According to Wang, hospital medicine is the fastest growing specialty on record because of the continued population growth.